The only city and capital of Cornwall, Truro is certainly no sprawling metropolis. Compact, beautiful, and full of elegant Georgian architecture. It is another maze of buildings and cobbled alley-ways. At one time a stannery town exporting ore, but things changed in the 18th century as it became fashionable with the Georgians, giving it the distinctive look that has been carefully preserved. In the 13th Century a castle was built during Henry II’s reign, the site is now occupied by the Courts of Justice, a building with an avant garde design. It was also home to a royalist mint during the civil war, but that was short lived. It was the flourishing tin smelting trade and other forms of industry that brought success to the town. In 1877 Queen Victoria granted it city status and three years later work was begun on the cathedral. Completed in 1910 it has one of the highest spires in the country, perhaps this is why it dominates the view wherever you are in the county town. It is unique in incorporating part of the parish church originally on the site, acting now as both cathedral and church. The arts and history are well represented here with a museum and numerous galleries. National and international exhibitions are featured. 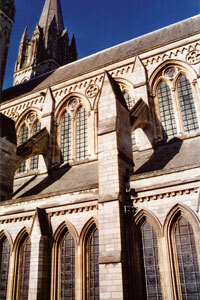 Accommodation in Truro and the areas around is of a high standard and good variety. This is becoming a very exclusive region. High quality hotels are located in the city, along with guest houses, bed and breakfasts and inns. All that you would expect from a city. Definitely a hub of activity, entertainment in Truro ranges from vibrant night life to performing arts. Free daytime entertainment fill the parks and gardens, while the streets are full of the sound of talented buskers. The Hall for Cornwall has quickly gained a reputation for the highest quality of performers. A full schedule throughout the year brings performing arts, bands and classical music into the heart of Cornwall. There is also a great deal of live music to be enjoyed in the many publics houses, and a night club. Set on three rivers, watersports are catered for. 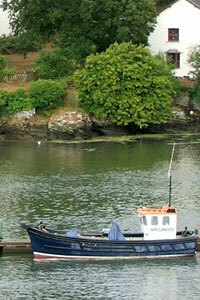 Ferries travel to Falmouth through stunning scenery, some of the most beautiful in the country. Also, not far south, is the National Trust’s Trelissick Garden beside the King Harry Ferry. The garden is reachable by road or ferry from Truro. 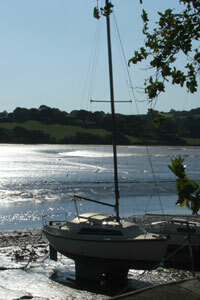 Golf, riding, fishing and sailing are all available here, along with a leisure centre and many walks. The standard of food in Truro is good enough to draw connoisseurs from all over the county. I know I cannot resist traveling to sample the latest from the changing menus featured in the many cafes and restaurants. It is well worth checking down side roads to find true gems when eating out in Truro, the best dining experiences in the capital are just slightly off the beaten track. In recent years Truro has undergone a transformation into a very fashionable location. The new pedestrianised area between Marks and Spencers and Hall for Cornwall complements the original area in the main high street. Truro does not just attract the familiar high street chains, but also the more exclusive ones such as Oh Knickers!, a very unique lingerie boutique. These work well with the many local specialist stores, so shopping in Truro is perhaps the best in Cornwall. The shops in Truro are varied, but, as would be expected of a city, many amenities abound, all with the character of the town and county. Flea markets, antique fairs and an undercover pannier market add to the range of tastes catered for. Set inland there is no chance of surfing here at Truro, but the city has many good surf shops and is not far from any of the top beaches. Make sure you check below to see what is available. The capital of Cornwall is certainly going to be easy to find, train, coach, bus, taxi and river routes are all well covered.